Nodland Construction Co. works across many sectors, taking on both municipal and private development projects. Clients include many highly regarded national homebuilders, long time local builders as well as many municipalities, counties and the Minnesota Department of Transportation. The company operates several heavy sewer and water utility crews, grading crews, and clean-up crews. 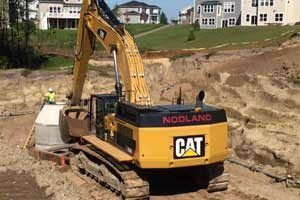 Nodland Construction Co. owns approximately 100 pieces of equipment manufactured by Caterpillar, Komatsu and Volvo. We have worked diligently through the years to develop and maintain long-standing relationships with a core group of loyal subcontractors and suppliers. By doing this, each project takes on a team approach and everyone works together to complete the project safely, on time and on budget. Nodland Construction Co. recycles as much as they can on all projects. Materials such as salvage steel, concrete and asphalt are all recycled and re-used. All of the oil is recycled and re-used, as are the filters and coolants. As a union shop, Nodland Construction works closely with the various unions and also provides its own sessions in the areas of safety and quality management. Teamwork is a core value at Nodland Construction Co., being a family-owned business that treats each other as family. This is the key to the success of the company. Tracewater 5th Addition is a large 82 Single Family Lot project in Savage, MN. Tracewater offered up many challenges for our utility crews. The sanitary sewer was over 40 feet deep and was installed with dual sanitary lines. A large portion of the sanitary sewer was also dewatered at the 40 foot depth. Creek Hill South is a large 67 Single Family Lot project in Savage, MN for Pulte Homes. Creek Hill South offered a deep 33” Fiberglass Trunk sanitary sewer installation. It also involved dual sanitary sewer mains. Lemay Shores is a large 60 Single Family Lot project in Mendota Heights, MN for Cal-Atlantic Homes. Lemay Shores was unique because there was sanitary sewer that ran inbetween a lake and an existing street. This section of sanitary could not be open cut, so we had to directionally bore a 24” casing and pull the sanitary through the casing to get the sanitary to the site. Ravinia was the beginning of a new big development in Corcoran, MN for Lennar Homes. This was an exciting new development with over 200 Single Family Lots, and brought sanitary sewer to this new area that did not have it before. This site was also challenging with over 40 foot deep sanitary sewer. Nodland Construction Co. has worked diligently through the years to develop and maintain longstanding relationships with a core group of loyal subcontractors and suppliers. By doing this, each project takes on a team approach and everyone works together to complete the project safely, on time and on budget. Nodland Construction Co. prides itself taking care of clients’ needs and being accountable for the work they do.